This walkthrough may not be sold and may not be used for any commercial purposes. Neither is it permitted to publish this walkthrough in any way without the written permission of the author. Feel free to place this walkthrough on your web site or on your home page, on condition that no part of this walkthrough is changed and that the name of the author (Dr. Hugh), the URL of the owner of this site (www.gamesover.com) and his E-mail address (gamesover@planet.nl) are mentioned unchanged. For the most up to date walkthroughs always visit www.gamesover.com. 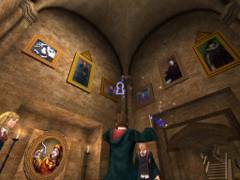 [3.1] Go down the stairs to Hogwarts main Entrance Hall. On the right hand side of the Monumental Staircase there is a chest from which you can get some Beans with Alohomora. On the left hand side stands a giant cauldron that you have to empty using Depulso by all three characters. That will get some more Beans. Turn around facing the entrance and notice two burning torches. Cast Depulso on each torch and they will lower. A Spongify tile will appear in the middle of the hall. Face the staircase, cast Spongify on the tile and jump along a track of Beans into your 1st Secret Room through a hole, finding a new tile and a chest. Cast Alohomora on the chest for the Beans and cast Spongify on the tile to go down again. Face the Staircase. There are four entrances, two on each side. The first of each side is locked and the second on the left leads to the Dungeons. Go in and have a look around. There is a Gargoyle. 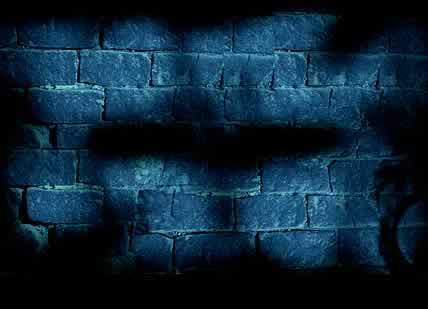 Cast Lumos on it and part of the wall on its left side will be charmed. Go inside the room (not a Secret!) and open the chest for Beans. Go out of there. Ascend the Monumental Staircase and enter through one of two openings to find a Save Book. Before saving, turn right and cast Depulso on the tin soldier and get his Beans. On the other side a guy is standing. Walk up to him and he’ll ask Harry in a Scottish accent if he’s looking for any rare Collector’s Cards? The Card he’s offering at 25 Bertie Bott’s Beans is the Witch Card # 1: Beatrix Bloxam, (1794-1810) – Author of the Toadstool Tales, a series of children’s books since banned because they have been found to cause nausea and vomiting. Now you have two options here: buying or not. If you don’t buy it now, you can always do it later. Now save by the Book. [3.2] Proceed up the next stairs and before following Fred to the right, turn left and cast Alohomora on the chest for some more Beans. Then follow Fred into the Hall of Floating Staircases (the Grand Hall). First turn right and go down to the lower floor level. There is a Save Book in the middle and a chest on the far end. There is no use in saving now, but you may open the chest with Alohomora to get more Beans. Return to the entrance floor. Go up the first set of stairs and on the second floor look left inside an arch. There is another Save Book! Go inside and avoid the Save Book. Left and right of the Save Book there is a Suit of Armor. The left one will shed a couple of Beans when shaken by Depulso. The one on the right hand side carries a shield and needs triple Depulso. Go left and turn left. There is a door that needs the Alohomora spell of three to open up. Go inside the room – not a Secret Room though – and cast Alohomora on the chest. That will augment your load of Beans. Get out of this room and face a giant cauldron in the corner on the right. Triple Depulso will get you even more Beans. There isn’t anything else to find further on, so return to the Grand Hall and follow Fred to the 3rd floor. Don’t take the middle stairs that will lift you up, but instead take the left stairs and enter the room on your left. There is another Save Book! Walk straight up to the Gargoyle and notice a Tapestry on each side of the statue. Cast Depulso three times on the left Tapestry and collect the Beans. Now the Tapestry will roll up. Turn around and cast Alohomora on the painting. It will slide upward revealing a niche with a Skull. Cast Depulso on the skull and get Beans and two Pumpkin Pasties. Repeat the same with the second Tapestry and get Beans out of the Skull. Now cast Lumos on the Gargoyle and an entrance will be charmed to its left side. Go in and meet a Chocolate Frog and a Spongify tile. Spongify the tile and go up to a higher floor. Turn right and find a chest in there. Alohomora will get you some Beans and two Pumpkin Pasties. Get down and turn right entering another room. Look left and cast a triple Depulso on the Suit of Armor with the shield to obtain more goodies. Then turn around and cast a triple Alohomora on the chest with three locks for even more goodies. Better not use the Book for saving here but keep it for later. Go to the 4th floor and enter. Cast Alohomora on the painting on your left which will slide upward and cast Depulso on the Skull inside for getting some Beans. Turn around and enter another classroom. There is a Skull on the window pane on the right side. Hmm … that does nothing. Go up to the 5th floor and enter left. Cast Alohomora on the chest for Beans and go up the stairs on your left. There is a giant cauldron and a triple locked chest in that room. Open both with triple Spells and get everything out. They’ll just give us some Beans. In the side room on the right there’s a Save Book. Good idea to save here. 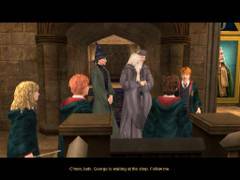 [3.3] Go up to the 5th floor and in a cut scene meet Prof. Dumbledore and Prof. Mc.Gonagall. Dumbledore seems glad that Harry is feeling better (from his encounter with the Dementor on the Express train). McGonagall: You’re probably aware … the Dementors of Azkaban are here at Hogwarts on behalf of the Ministry of Magic Business. Apparently they brought them in to protect Hogwarts from Sirius Black! Ron: I’ll bet Sirius Black steers well clear of Hogwarts with those Dementors lurking about. Don’t pay attention to Fred who is urging them to go visit the shop. Go inside here and cast Depulso on the Suit of Armor on the left side. Cast triple Alohomora on the triple locked chest on the left too. That will augment your purse with Beans. On top of the Suit of Armor there is a painting you can cast Alohomora on. It will slide upward and unveil a Skull. Cast Depulso and the Skull will spit out Beans. Turn around and look up. There are two small paintings on each side of the tall painting. Cast Alohomora on each and a door on your left will lift up. Follow Fred to the 7th floor. In this room there is a portrait of a Living Lady, a Save Book, and a giant cauldron. Flip the cauldron with triple Depulso for a few Beans more. Left of the cauldron is a door. Cast Alohomora and enter the next room. Turn left and cast Depulso on a Suit of Armor and get out the Beans. Turn around and cast Depulso on the globe. Two cabinets will appear on either side of it. Cast Depulso on one of them and the Tapestry above the globe will roll up revealing an opening. Also a Spongify tile will appear in the center of the floor. Spongify the tile and bounce up into the hole. Not a Secret Room, but you can cast Alohomora on the chest in there and extract lots of Beans! Get out of there and save by the Book. [3.4] Approach the painting of the Living Lady and it will slide to the left revealing a passage. Harry says: Fortuna Major. Ascend the stairs and notice a Suit of Armor with a shield in front of you. Cast triple Depulso and get a number of Beans out of it. Turn right and notice two entrances. The left one is the entrance to the shop and the one in front gives access to the Gryffindor Common Room. Proceed but stick to the right wall and enter the Common Room. Wait here for a while. You’ll be warned that Peeves is hanging around in this area. On your right there is a cabinet under a tall painting. Cast Alohomora on it for the Beans. Go out and a cut scene will appear where Hermione leaves: Umm... see you two later. Just remembered I’ve got to see Professor McGonagall about something. Then Harry and Ron will enter the shop. There are Collector’s Cards for sale at various prices. Most go for BB Beans 25. The three on the side are rare and the middle one is priced at BB 125. There is a side room with a special Card, which you will obtain after you’ve collected all the Cards. Harry can’t buy Portrait Passwords yet. You need 10 Cauldron Cakes for one and at this point you won’t have more than 9. You can always return to the shop later on. So leave here and Peeves will appear: Boo-hoo-hoo! Potty and Weasel! Apparently Peeves has a Portrait Password and now it’s your turn to take that from him. There is an autosave now. 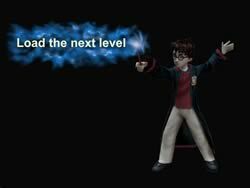 [3.5] Cast double Rictusempra on Peeves and meantime keep going from left to right with your strafe keys to avoid his fireballs. After 4 double hits Peeves will angrily leave: Nasty, nasty Potty and Weasel! You haven’t seen the last of me! The Poltergeist drops a document with the Passwords. They only work on paintings that carry the same number (the numbers 1-7 refer to the floors). 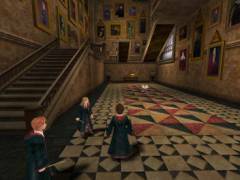 In a cut scene you will follow Harry and Ron going through a painting # 7 giving direct access to the side chamber. There you’ll meet Hermione: It’s almost time for Care of Magical Creatures Class! Then Neville comes into the scene: Follow me! Follow Neville through the Entrance Hall to the main Entrance Door. The game will be loaded and an autosave made.